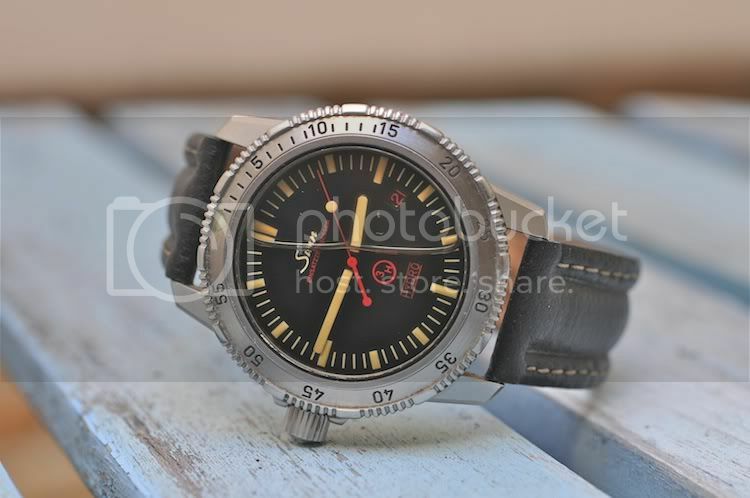 The ancestor of the current Sinn UX.GSG9 was the Sinn 403.Hydro in EZM.2 execution. This watch was fully oil filled as well, to be absolutely free from fogging, pressure-resistant at any accessible diving depth and perfect readability from any angle under water. As a automatic/mechanical movement won’t work fully drowned in oil, Sinn developed a special quartz movement for this model to be equipped with. Quartz watches need new batteries though, something which you should not have carried out by you local department store. And if you do, the results can be seen by the picture here above. This entry was posted on April 19, 2011 at 12:25 and is filed under all, front page, uncategorized. You can follow any responses to this entry through the RSS 2.0 feed.